Boston Stone Works - Stone Tile Supplier. Natural and engineered stone tiles have been used in residential and commercial interiors for walls and flooring for countless years. Slicing boulders and slabs of rock delivers tiling products that come in a variety of shapes, sizes, and finishes. The appearance of stone varies from tile to tile due to veining, natural hue and tone variation, and color palettes. No matter what shape or type of tile you choose, natural or engineered stone products offer a sense of permanence and character that surpasses any other wall or flooring material. We, at Boston Stone Works, have been helping homeowners and building professionals select, design, and install custom stone tile products for numerous years. Whether picking a backsplash tile to accent your kitchen countertops or bathroom vanity top, or choosing a tile for a stone shower enclosure, Boston Stone Works has the knowledge, expertise, and design skills to help you create and incorporate your personal touch in the tiling project you’ve always envisioned. 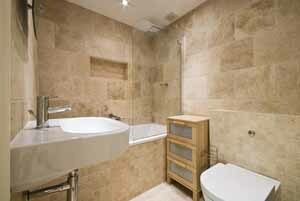 To see more tiling projects, visit our Tiling Gallery.